Thank you so much to all of the bloggers who joined in with last month's #LoveNorthEast - we loved reading all of your posts and hope you link up again this month. 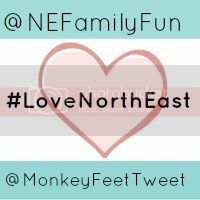 #LoveNorthEast is a place for North East bloggers to link up their favourite posts of the month so they are all in one convenient place - it's a fab way to build our community, discover new bloggers and receive extra views and comments on posts you would particularly like to shine. My favourite post of last month was this one featuring the Watch House Museum from babyfoote. I can honestly not believe that I did not know this place existed!! Will definitely check it out when we are next in Tynemouth. 2 - Share our favourite posts across our own social media (combined 20k+ followers). 3 - Both choose our favourite blog to showcase in next month's post.